The second-highest annual total of 931 incidents came in 2009, also a year when there was a major conflict in Israel and Gaza. In contrast, there was no similar ‘trigger event’ in 2015 to explain the relatively high annual total. There were 535 antisemitic incidents recorded by CST in 2013, 650 in 2012 and 609 in 2011. CST has recorded antisemitic incidents in the UK since 1984. The highest monthly totals recorded by CST in 2015 were in January (109 incidents) and February (88 incidents). This may suggest that a higher proportion of incidents were reported to CST and / or Police during those months, as a result of increased concern in the Jewish community following fatal terrorist attacks against Jews in France (9 January) and Denmark (15 February). However, the monthly incident totals recorded by CST remained relatively high throughout 2015 and few incidents included references to terrorism. This may either indicate that the true number of antisemitic incidents taking place has remained high compared to the years prior to 2014; or that a higher proportion of incidents is being reported to CST and to the Police than in previous years; or it may be due to a combination of these and other reasons. The 924 recorded antisemitic incidents included 86 violent antisemitic assaults, an increase of 6 per cent from 2014 and the highest number of violent incidents since 2011. This is the only antisemitic incident category that increased in 2015. Four of these violent incidents were classified by CST as ‘Extreme Violence’, meaning they involved potential grievous bodily harm (GBH) or threat to life. There were 65 incidents of Damage & Desecration of Jewish property in 2015; 685 incidents of Abusive Behaviour, including verbal abuse, antisemitic graffiti, antisemitic abuse via social media and one-off cases of hate mail; 76 direct antisemitic threats; and 12 cases of mass-mailed antisemitic leaflets or emails. All of these decreased from the 2014 totals. 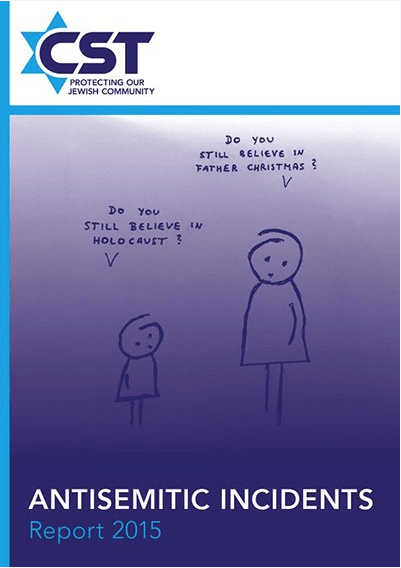 The most common single type of incident in 2015 involved verbal abuse randomly directed at visibly Jewish people in public. In 354 incidents, the victims were Jewish people, male or female, attacked or abused while going about their daily business in public places. In at least 161 of these incidents, the victims were visibly Jewish, usually due to their religious or traditional clothing, school uniform or jewellery bearing Jewish symbols. Three-quarters of the 924 antisemitic incidents were recorded in Greater London and Greater Manchester, the two largest Jewish communities in the UK. There were 472 antisemitic incidents recorded in Greater London (compared to 592 in 2014) and 226 incidents in Greater Manchester (309 in 2014). Beyond these two centres, CST recorded 226 antisemitic incidents in 82 locations around the UK, including 34 antisemitic incidents in Leeds, 29 in Hertfordshire (of which 18 were in Borehamwood), 13 in Liverpool, 11 in Birmingham and 6 in Bradford. CST recorded 159 antisemitic incidents that involved the use of social media to transmit antisemitic threats or abuse, which represents 17 per cent of the overall total of 924 incidents. For comparison, 234 incidents involving social media were recorded in 2014. Incidents involving the use of social media are only recorded by CST if they have been reported by a member of the public who fulfils the role of a victim or witness; if the comment shows evidence of antisemitic content, motivation or targeting; and if the offender is based in the United Kingdom or has directly targeted a UK-based victim. "We must be ever-vigilant about antisemitism and all forms of extremism. That is why I welcome this important report by the Community Security Trust and applaud them for the work that they do. Whilst it is good to see a fall in antisemitism since the record high in 2014, there is absolutely no room for complacency: this is still the 3rd worse year on record. Antisemitism is repugnant, unacceptable and scars our society. 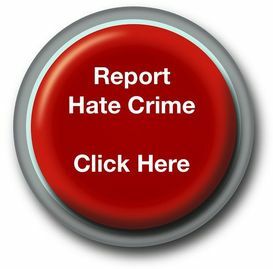 I would urge anyone who experiences hate crime of any kind to report it to the police. The CST does vital work securing the security of the Jewish community. But more needs to be done. The rise in all forms of extremism requires political as well as community action. We need to understand the roots of the prejudice and hatred that fuels extremism and work with communities to tackle it at source."